This nourishing rice bowl is seasoned with a light sauce made with Anaheim peppers and bunches of fresh herbs. 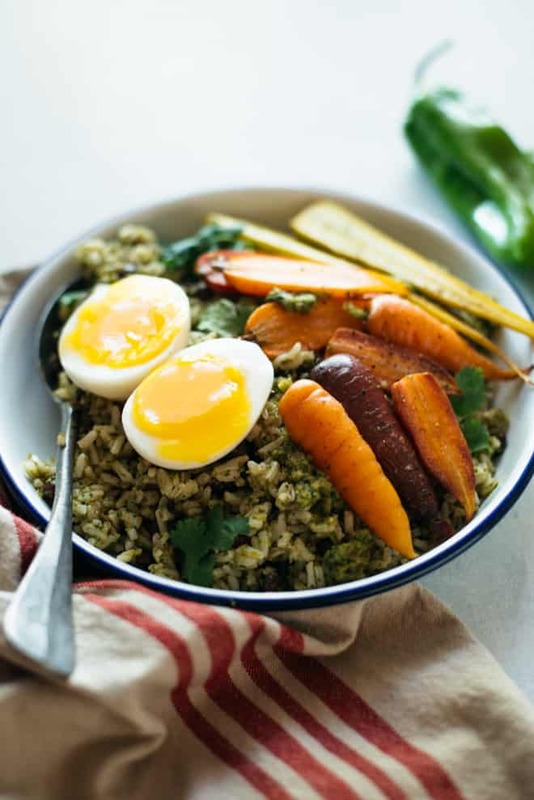 Pair it with roasted carrots and some eggs for a delicious meal! Hi, y’all. I just got back from Austin for BlogHer Food—my first official trip to Texas! In 72 hours, I managed to eat my way through plate after plate of finger lickin’ BBQ ribs and breakfast tacos. My belly is still full and I have forgotten how to eat like a lady. It was the perfect food adventure, and I’m so glad I got to share it with my friends! Now, it’s time to get back into my regular rhythm of lighter foods and roasted vegetables. This rice bowl is the first real meal I ate when I got back to Sacramento. I sautéed sliced Anaheim peppers with onions and garlic and blended everything with a bunch of cilantro, scallions, a bit of acid and a touch of honey. It’s funny, I never used to add honey to sauces, but just a touch of it makes huge difference to the flavor of any sauce. The honey definitely makes a big difference in this one. I loved this green pepper sauce so much that in my recipe notes, I wrote down “THIS SAUCE IS AWESOME! !” That’s saying a lot. The sauce gets better over time: The green pepper sauce tastes even better if you make it overnight. I refrigerated a batch in a container and it was still fine after 4 days. Type of rice: I didn’t realize that I was particular about rice until I started testing this rice bowl. 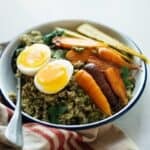 Personally, I didn’t like the taste of long grain brown rice for this recipe because I thought the flavor was slightly off. Then, I tried using plain white rice and the taste and texture was worse than using brown rice. I highly recommend using jasmine rice for this rice bowl if you can! Soft Boiled Eggs: I wanted eggs with runny yolks for the rice, so I decided to steam eggs for about 7 minutes. The outer part of the yolks firmed up, but the center was still runny when I cut into them. If you prefer hard boiled eggs, steam or cook them in boiling water for about 10 minutes. Substitutions: If you can’t find Anaheim peppers, go for 2 medium green bell peppers. Preheat oven to 400ºF (205ºC). Line a baking sheet with parchment paper or a silicone mat. Prepare Carrots: Peel and slice carrots into 1/4-inch slices. I used small and thin rainbow carrots I found at the farmers market and just sliced them in half, lengthwise. Toss carrots with 1/2 tablespoon olive oil and a pinch of salt. Spread carrots onto a baking sheet and bake for 8 to 12 minutes, when the carrots can be easily pierced with a fork. Prepare Eggs: To hard boil the eggs, fill a medium saucepan 3/4 full with water and bring water to boil. Add eggs into boiling water and cook for 6 to 8 minutes for soft boiled eggs or 10 to 12 minutes for firmer yolks. To steam the eggs, fill a small pot with 1 1/2 inches of water. Fit a steamer basket on the pot and bring water to boil. Add eggs and steam for 6 to 8 minutes for soft boiled eggs or 8 to 10 minutes for firmer yolks. Run eggs under cold water before peeling. Prepare Sauce: Heat 1 tablespoon of olive oil in a large pan or skillet over medium-high heat. Add onions and cook for about 2 minutes, until they start to soften. Add peppers and cook for 4 to 5 minutes, until they soften. Add a pinch of salt and sliced garlic and cook for another minute. Turn off heat and let the vegetables cool in the pan for 10 minutes. Transfer vegetables into a food processor. Add remaining tablespoon of oil, garlic, cilantro, scallions, lemon juice, vinegar, paprika and honey to a food processor. Mix until you get a sauce, scraping down the sides if necessary. Taste and season with salt, if necessary. In a large bowl, mix sauce with rice. I used about 3/4 of the entire batch and left some extra to serve on the side. If your rice is cold, heat it in the microwave for 1 to 2 minutes first. Mix in the beans. You can also heat the beans in the microwave, if you like. Season with more salt and pepper to taste. 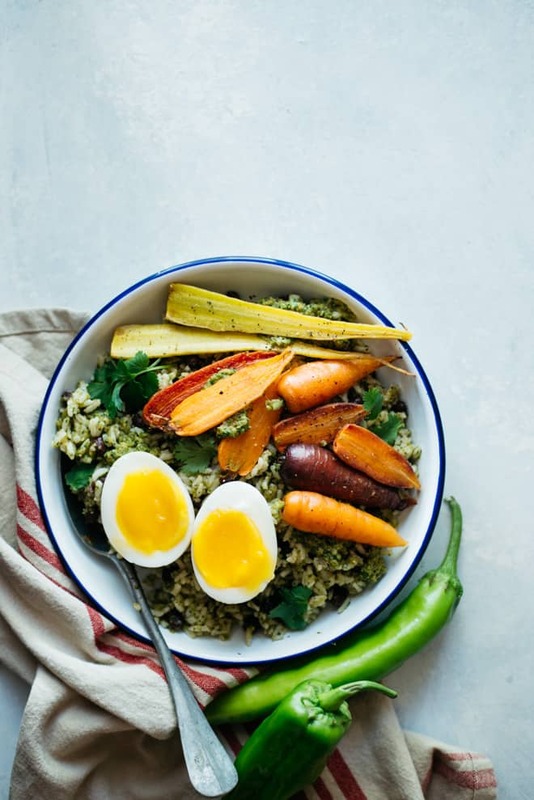 Serve rice with roasted carrots and eggs. *1. I cooked 1 1/2 cups jasmine rice and it yielded about 4 1/2 cups cooked rice. 2. If you don’t have white wine vinegar, you can replace it with apple cider vinegar, though I didn’t the flavors as much. Great recipe! I have a huge bag of quinoa from Costco, so maybe I will try this recipe with quinoa! I’ll let you know how it goes. Thanks for another tasty recipe! Yes, it should work with quinoa, too! Thank you! How do you steam eggs like that? I only know of hard boiling ! Austin is such a fun city and the food scene is fabulous – similar to Seattle and San Fran! Love that town and if I ever had to move back to Texas, Austin would be it! No doubt BBQ is over the top there. This bowl is SO packed with flavors.. that sauce has me all heart eyes, Lisa! Delicious work !